nam misbehaves (or does not work) in recent Ubuntu and Mint distributions. 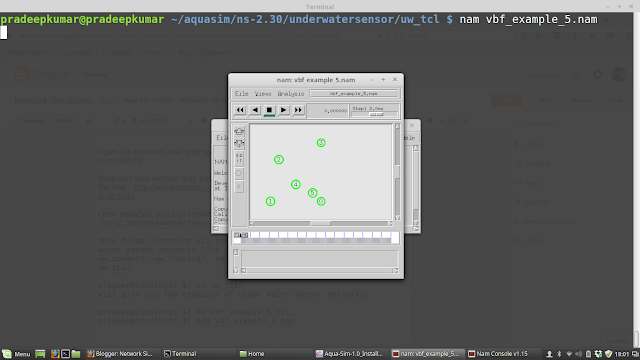 Need to have the X11, automake and build essential tools to install Aquasim. After setting these paths, you logout and login back and aquasim works well now. Open the terminal and type ns, if it indicates a %, then aquasim was installed successfully. will give you the examples of under water sensor networks. This post does not handle the Aqua 3d where you have the option of viewing the nodes inside a water using a 3D view. Users are requested to try themselves for installing Aqua 3D. Comment below for any queries related to this installation.